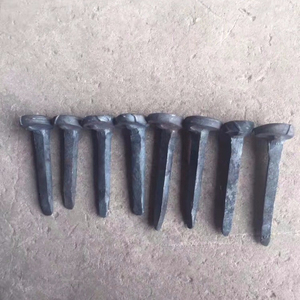 22mm Grade 4.6 ASTM A65 Gr1,Gr2 4.6 4.6 Material low carbon low carbon SS41 low carbon Surface Standards BS70R, BS60R AREA JIS E1108 AS 1085.8 Packaging & Shipping We manufactures Rail Spike, Rail E Clip and Clamp, High Tensile Bolt with Nut and Washer, Rail Base(Tie) Plate, Rail Fish Plate, Rail Shoulder, Rail Screw and Spike, Fish Bolt with Nut and Washer, Rail Dowel, Rubber and EVA Pad, Crane Rail and Light Rail, Wooden Sleeper, Auto Bolt and Other spare parts. 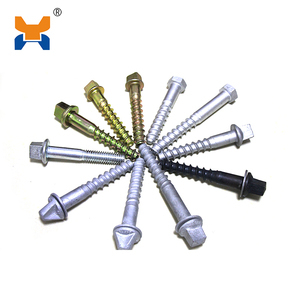 , Ltd manufactures railway fasteners and standard As a leading railway fasteners manufacturers in China,with production license of Chinese railway Ministry, advanced technology, high precision inspection instruments and service, our products have been widely exported the USA, Germany, Spain, Japan, Australia, Italy, Netherlands, Belgium, Poland, the UK, India, and South Africa etc. Our main products are as following: 1. 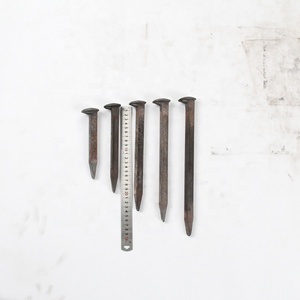 Screw spike/Coach screw/Drive screw/Sleeper Screw, Dog spike/Railroad spike/Lock spike/Cut spike,etc. 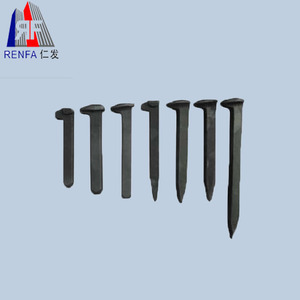 2 YRS Anyang Railway Equipment Co., Ltd.
7 YRS Wuxi Lanling Railway Equipment Co., Ltd.
1 YRS Wuxi Longma Plastic & Rubber Co., Ltd.
Railway accessories, elastic clip, Screw Spike,etc. 13 YRS Anshan The Third Steel Rolling Co., Ltd.
3 YRS Benxi Public Power Railway Equipment Manufacturing Co., Ltd. The top and bottom edges are tapered inwards so the device wedges itself between the top and bottom of the rail when it is bolted into place. 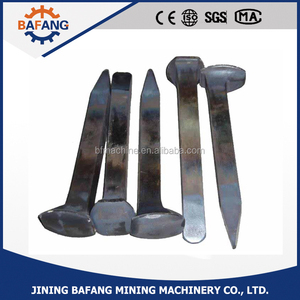 Product Details A ra il spike (also known as a cut spike or crampon) is a large nail with an offset head that is used to secure rails and base plates to railroad ties (sleepers) in the track. Rail clamps are always fastened onto the rail ties with anchor bolts. 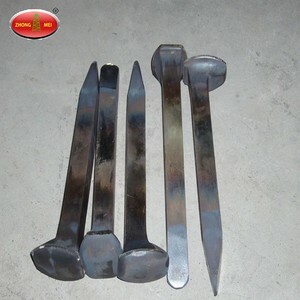 Alibaba.com offers 1,042 railway spikes products. About 1% of these are other parts & accessories, 1% are anchors, and 1% are nails. 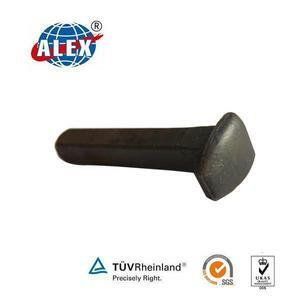 A wide variety of railway spikes options are available to you, such as free samples, paid samples. 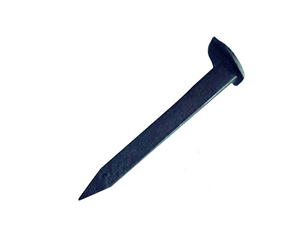 There are 1,042 railway spikes suppliers, mainly located in Asia. 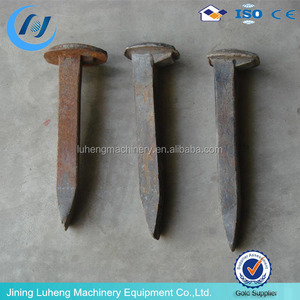 The top supplying country is China (Mainland), which supply 100% of railway spikes respectively. 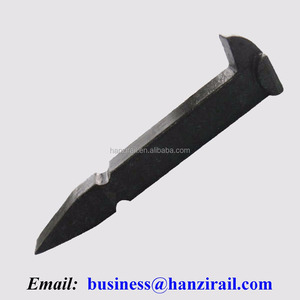 Railway spikes products are most popular in North America, Domestic Market, and Southeast Asia. You can ensure product safety by selecting from certified suppliers, including 396 with Other, 368 with ISO9001, and 78 with ISO14001 certification.